I’m no longer interested in playing golf anymore, but I found it odd that the 2018 Masters banned crowds from cheering “Dilly Dilly” because, well, they can. Between you and I, do you really think they will throw out hundreds of spectators for cheering a great drive by chanting that phrase? Carrying the torch for Tiger’s old Nike Golf commercials – here’s the original and a few other versions. 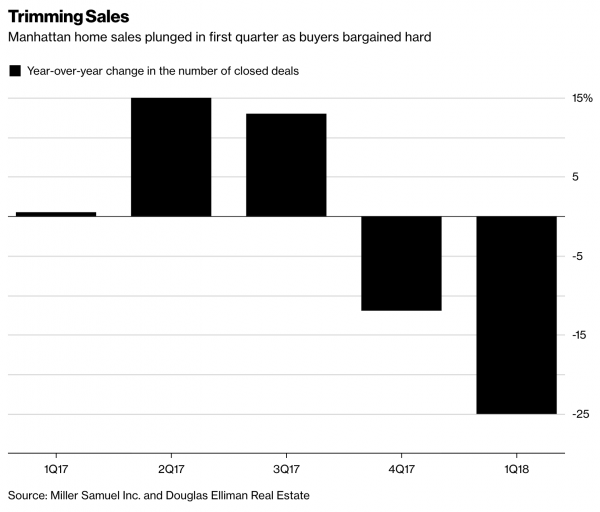 As most Housing Note readers know, I’ve been writing the Elliman Report series for Douglas Elliman Real Estate, the (now) third largest real estate brokerage firm in the U.S. since 1994. The market report focused on the drop in sales, the largest year over year decline in 9 years and the lowest total in 6 years. About a third of the decline was attributable to the expiration of the “legacy contract pipeline” which was comprised of older new development contracts purchased off of floorplans. These units were skewed much higher in price, reflecting the early phase of the new development boom. Once their respective buildings were completed, these units closed and joined more recent sales, skewing overall price trends and sales levels higher. Now that these units have largely been sold off, their impact overstated the decline in sales and prices. For example, the median sales price of all apartments that closed in the first quarter fell 2% YOY to $1,077,500. However when the market was parsed out by existing and new development, both segments showed a rise in median sales price. That’s because new development sales dropped 54% YOY (while their median sales price rose 3.9% YOY to $2,802,937) and existing sales fell 17.5% YOY (while their median sales price rose 4.3% to $965,000). About two-thirds of the YOY sales decline reflected the “uncertainty” in the market. December 22, 2017, federal tax law was a large part of the market easing even though it is too early for the technical implications of the tax law to impact prices. In fact much of the actual impact will be tested in court findings – ie how the tax law is interpreted. Consumers have a lot to process. Will mortgage rates actually rise? What is the economic policy coming out of a chaotic Washington DC environment? Consumers are grappling with the idea that the federal government has essentially extracted itself from “homeownership promotion business” hoping that doubling standard deductions will offset more direct incentives through itemizations. Buyers and sellers are going to go through a rebalancing act in their understanding of what values are in the future. I call that “price discovery.” Markets with much lower housing prices than Manhattan with much lower real estate taxes may see a limited impact after all is said and done. Much of the post-tax law world is dependent on price levels in a market, how much property taxes and SALT are, as well as what a buyer or seller’s personal financial situation is. The Bloomberg piece that covered the report was the number 1 most read article on Tuesday all day. I don’t see this decline in sales phenomenon as the onset of a continued linear trend but more as a reset event. And in many ways, this event helps get the issue out in the open and could actually help buyers and sellers come to terms with new conditions. “Correction” – Speaking to a group of real estate agents and brokers the other day, it was clear to me that there was some nuance lost with the word “correction” as in “the market experienced a price correction this quarter.” The word “correction” conveys that the prior pricing was “wrong” rather than economic conditions that created value had changed. Values change over time as economic conditions and tastes change. Perhaps “reset” is a better term, since it doesn’t convey right or wrong pricing, that values returned to levels that reflect prior economic conditions. What’s more nuanced than simply saying “Dilly Dilly” when the situation calls for it? Just a nuanced thought. 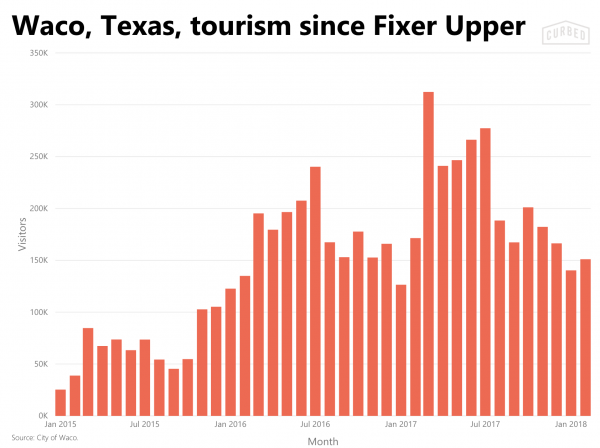 Waco Texas, home of Joanna and Chip Gaines’s hit HGTV show Fixer Upper has helped Waco become a tourist destination and as presented in this Curbed read, reduce its association with cult leader David Karesh. I remember seeing t-shirts in the early 1990s that said: “My parents went to Waco and all I got was this lousy AK-47.” Thanksfully times have changed. With all the bad and confusing news in the world these days, it’s refreshing to see a housing reality show have such a positive impact on a city. My friend and data management savant Mark Stockton penned a great article on statistics being tossed around by the major players in the valuation industry is misleading. Mark, Phil Crawford and I got to talking about this topic after reading a recent Appraisal Buzz article: Evolution in the Industry. Well intentioned I’m sure, but presents a tired and misleading message that I interpret as “embrace technology for the sake of technology” as if the default position on technology is that it always is “better” than the alternative.” The reality in valuation is that most of it is crap, but the big dogs in the space have a vested interest in making this 100% about automation. This is a very nice, neat definition to describe something that is extremely elusive. Mr. King performs several analyzes in order to draw conclusions about error rates in sale prices. Among them, he looks at sales for a subset of homes that, “Aside from minor differences in maintenance and upkeep…are nearly as substitutable as stock certificates.” He observes price differentials reaching nearly 15% in a single month. Fannie Mae’s definition of market value does not state that sale price equals market value. 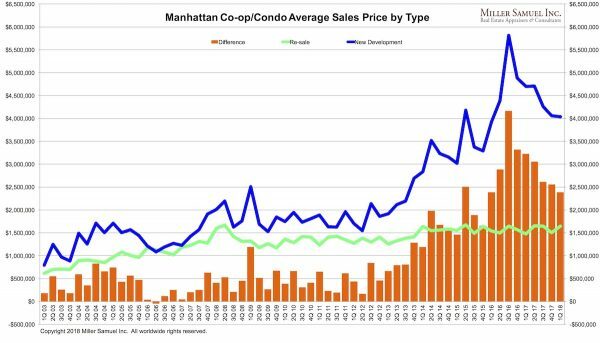 As Mr. King’s analysis makes abundantly clear, real estate markets by nature are imprecise, and the correlation between sale price and true market value can be difficult to reconcile. However, sale price is the benchmark most often used to test the accuracy of real estate valuation models. Every national valuation company that utilizes automated valuation technology represents their value estimates are accurate, within certain parameters. These accuracy statistics are generated in blind testing where value estimates are compared to actual sale prices (sometimes contract prices and appraised values, as well), and differences are reduced to a percentage of error. Those of us who deal with real estate analytics on a day-to-day basis recognize that statements like these are entirely misleading. When the market itself is less than exact, how can one expect value estimates benchmarked against sale prices to be predictably accurate? We need to change the narrative from a discussion of accuracy to a discussion of “defensibility”. A valuation provides an estimate or opinion of value. The accuracy of that estimate cannot be conclusively determined from a mere representation of precision, unaccompanied by documentation that adequately supports that statement. The results of a test which compares value estimates with sale prices might seem reasonable at first blush, but we know without reservation that sale prices are not precise measures of “market value”. If our target or benchmark value is inexact, how can we make definitive statements about the accuracy of estimates that are compared to those values? In addition, accuracy statistics published by valuation companies relate to tests performed on large sets of data; they are not granular enough to be meaningful at the property level. It is doubtful that someone living in Houston, TX cares about the statistical accuracy of values computed for all of Harris County. They likely are concerned with the accuracy of the value estimate for their home – and they won’t get that from the valuation company. On the other hand, if each valuation is accompanied by thorough documentation that allows the recipient to understand with complete transparency how the value was derived, the recipient can then form an educated opinion as to the reasonableness of the value conclusion. If they can form an opinion about the value conclusion – whether they agree with it or not – the estimate becomes a useful tool that can be used in a decision-making process. Otherwise, it is useless. So, while the results of tests performed against large volumes of sale prices are useful to the analysts who strive to improve their valuation models, they have little or no application for those who are concerned about the accuracy of individual home values, or groups of values as might exist in a portfolio. Defensibility is key to understanding whether a value is “accurate”, i.e. reasonable in light of supporting documentation. We need to move away from the absurd reliance on accuracy rates we know to be false, and move toward reliance on definitive, factual documentation that allows us to form an honest opinion about the reasonableness of value estimates. In reference to the damning FHFA white paper published last month, Phil Crawford breaks it down on his Voice of Appraisal Podcast: E196 The AMC Report Card…OUCH! And I’ll say Dilly Dilly!